Frequently the Bible records the statements of various foreign rulers. One such record is that of the Assyrian king Sennacherib. The Theological Wordbook of the Old Testament comments on the term Cush (Ethiopia) as it is used in several Old Testament prophecies. In several cases, especially in the prophets, Ethiopia is used in parallel construction as a synonym of Egypt (Isa 20:3-5; Ezek 30:4; Nah 3:9). This probably represents the dominance of Ethiopia (or, more precisely, Nubia) over Egypt between 750 and 663 B.C. Terhakah was a notable Nubian pharaoh who tried, unsuccessfully, to block Sennacherib’s westward expansion (2Kings 19:9 ; Isa 37:9). After 663 B. C. Egypt was independent of Nubia (Jer 46:9; Ezek 25:4, 5, 9). Tirhakah under the protection of the god Amun. British Museum photo by Ferrell Jenkins. 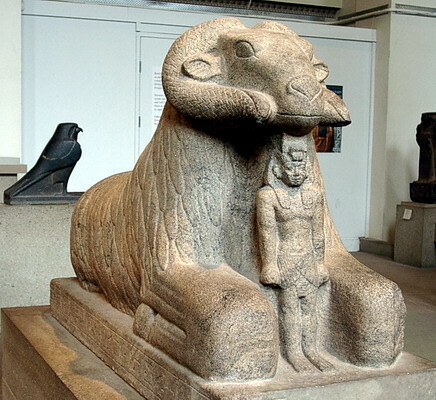 This colossal statue shows Tirhakah standing under the protection of the god Amun shown as a recumbent ram. The gray granite sculpture, dating to about 675 B.C., was found at Karnak. This granite is typical of the Aswan area. Yesterday afternoon we visited a Nubian Village on the banks of the Nile River at the first cataract of the Nile at Aswan. The Nubians at the village originally lived south of Aswan in the ancient territory of Cush. When the new High Dam was built on the Nile the Nubians were moved to other settlements. 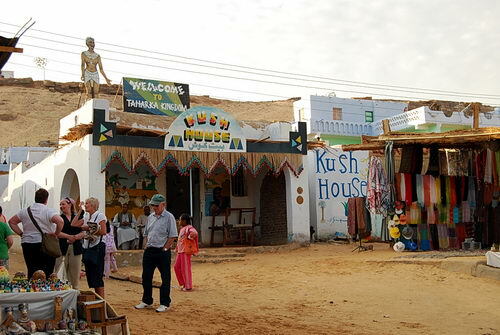 House of Kush at Nubian Village, Aswan, Egypt. Photo by Ferrell Jenkins. This photo is especially for Mrs. Caldwell’s class at the Florida College Academy. I hope you are enjoying the photos of Egypt. This entry was posted in Bible Study, Egypt, Old Testament and tagged Cush. Bookmark the permalink.